Human dispatchers are key to an efficient emergency response. The goal of AI-mergency control room (AICR) is to ensure dispatchers stay productive during emergencies. AICR is a web application that supports the dispatcher during the complete workflow of handling an emergency. As Hurricane Katrina hit the Gulf Coast and flooded New Orleans, the number of emergency calls increased eightfold over the course of four days. Yet the number of skilled dispatchers taking those calls remained the same. This situation, unfortunately, is not unique. A natural disaster can easily overwhelm a call center, which is why a team of IBMers created a web application to support dispatchers and ensure they stay productive during emergencies. “If there’s a natural disaster somewhere and there’s a quick need for quite a few people to become operators, they can use our software with the experience that’s built in to become an efficient operator without being trained for two years,” said Alexander Lang, lead architect, IBM Watson Analytics for Social Media. Lang and his colleagues – software engineers Thilo Götz, Julia Hancke-Stützle and Simone Zerfass, and visual designer and design lead Tim Reiser – created “AI-mergency Control Room (AICR)” as part of the 2018 Global Call for Code challenge. When disaster strikes, dispatchers can struggle to prioritize incidents, particularly when they are reported more than once across operators. Manual tracking of first responder teams can also take a dispatcher’s time away from manning calls. 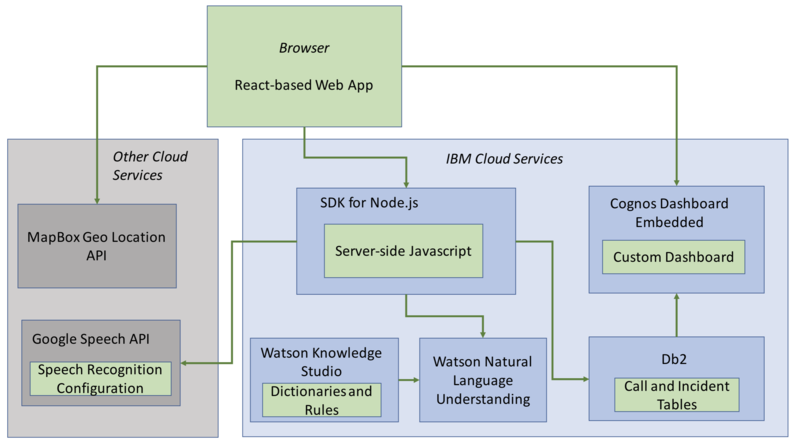 AICR uses a bevy of IBM Cloud services, including Watson Text to Speech, Watson Natural Language Understanding and Watson Knowledge Studio, to automatically transcribe incoming emergency calls and extract the details. The emergency incidents and their status are visualized in a map within Cognos Dashboard Embedded, giving the operator a full overview of the current situation and more. 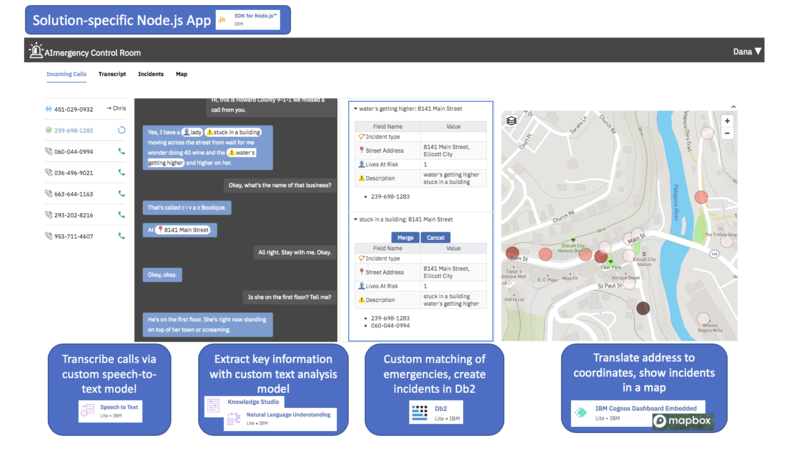 This helps dispatchers prioritize incidents across all reported emergencies, determine where rescue teams are already deployed and track emerging hotspots. All call information is stored in a database, powered by Db2, allowing for full visibility and traceability of events during and after a disaster. How will AI-mergency help my community? The team hopes AICR will prevent “dispatcher fatigue,” allowing less-skilled dispatchers who are brought into the disaster area to ramp up quickly and become productive.